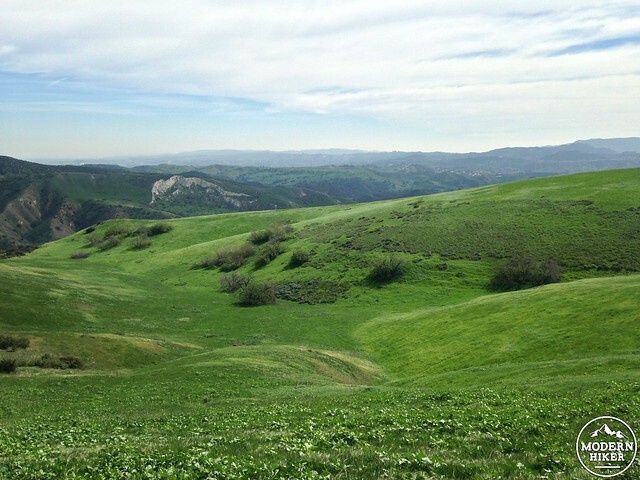 This beautiful trek on the western edge of the Upper Las Virgenes Canyon Open Space Preserve differs greatly from the more popular routes starting from Victory Trailhead on the eastern end of the Open Space. 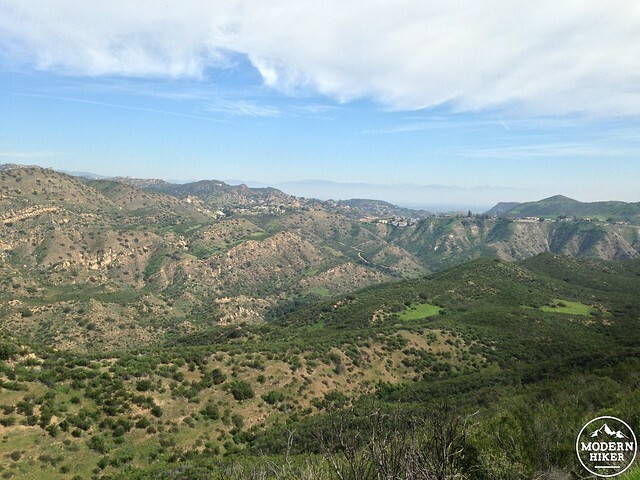 Although they were both part of the same fairly recent land purchase and former Ahmanson Ranch, the eastern half of the Open Space is more rolling hills and meadows, while this hike takes you inside Las Virgenes Canyon itself and back along a ridge with majestic views of the Santa Monica Mountains and neighboring Cheeseboro Canyon. 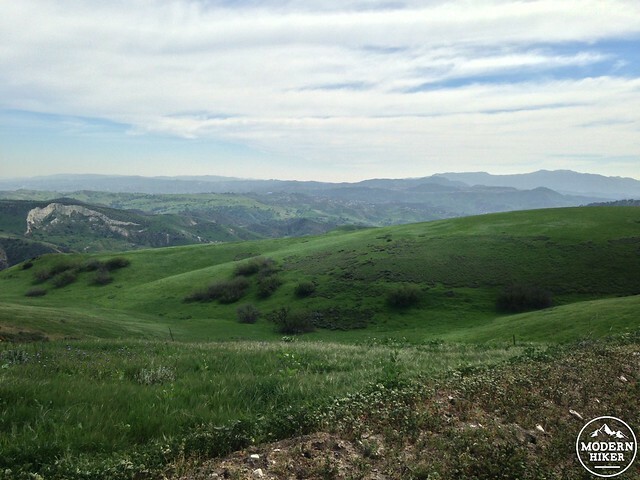 The western entrance to the Open Space seemed significantly less-traveled than the Victory Trailhead, so if you want to enjoy this beautiful stretch of land but still have a taste of solitude, this is definitely the way to go. 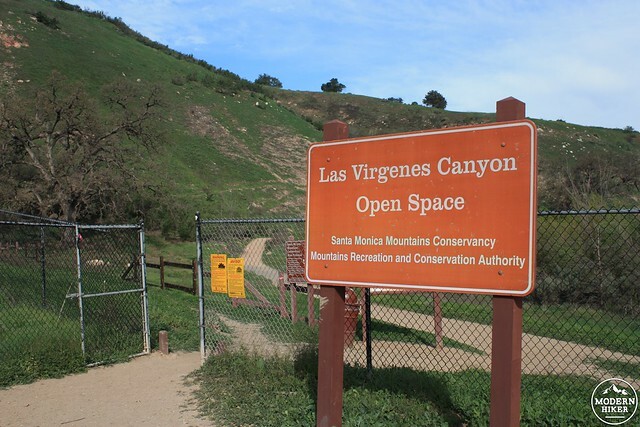 Park at the end of Las Virgenes Road and look for the gate with the prominent Las Virgenes Canyon Open Space sign (it’s pretty hard to miss). Check the boards to see if there are any trail closures or warnings and begin your hike on the wide dirt path. The path skirts a large patch of California sagebrush and passes a few beautiful, mature valley oaks in this early section of the hike. Keep an eye out for popping leaves early in the spring – and the telltale signs of woodpecker work on the tree bark. 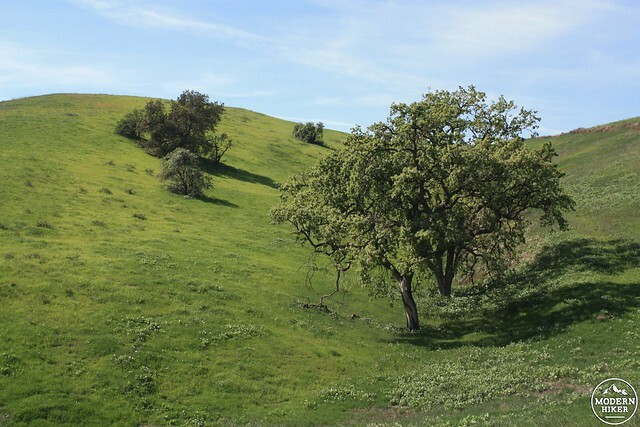 To the east, rolling hills dominate the landscape – green in the winter and spring and gold in late spring / early summer. You may also notice a whiff of rotting eggs near the valley floor here – the result of a sulfur spring in the region. Hold your nose (or just breathe through your mouth) and just before the 0.4 mile mark, you’ll hop across the creek bed and reach a junction with an unsigned, wide trail. 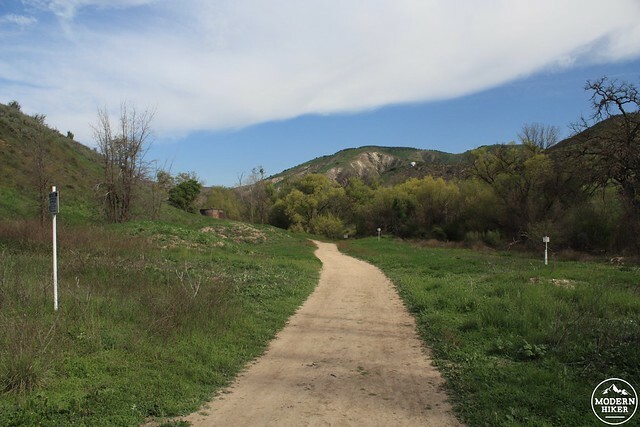 This is the East Canyon Trail – heading to the right here will take you into the Upper Las Virgenes Canyon Open Space Preserve and meet up with the southwestern-most portion of our Victory Trailhead Loop. For this route, however, stay to the left to follow the Canyon Trail. 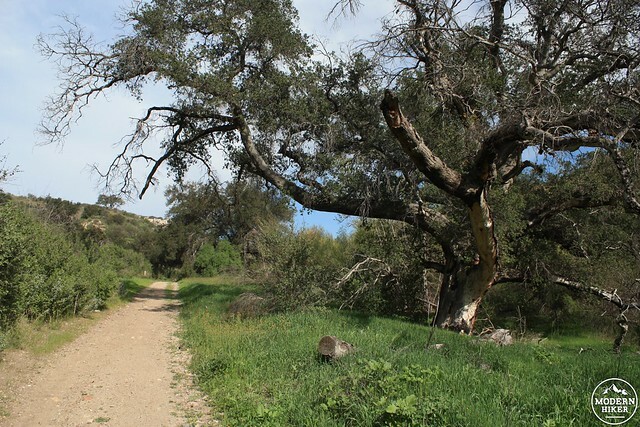 The Canyon Trail heads north-northwest following Las Virgenes Creek, and crosses the creek bed a few times along the way. At most times of the year, you won’t have to worry too much about boulder hopping, although water may pool in certain parts of the path. Just before you reach the mile mark, ignore the trail that looks like it’s heading up a hill near a chain-link fenced off area … even though it very much looks like the sign is telling you to go there. 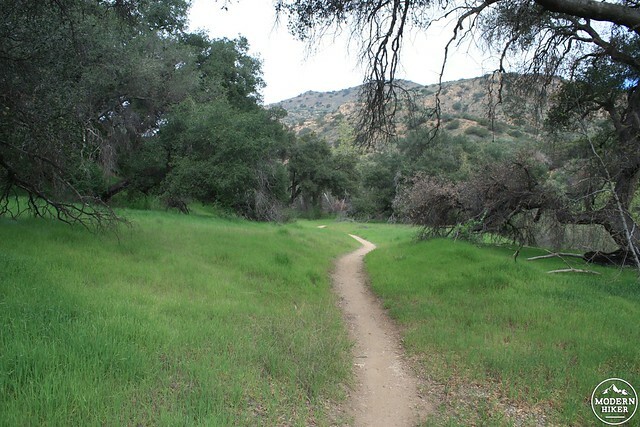 Instead, stay on the wider Valley Trail and stay right at the junction with the unsigned Upper Las Virgenes Connector Trail just past the fenced-off area, heading toward an old, rusted water tank and back into the creek bed. If you’re a fan of old ranch equipment, just past this junction the trail hops across the creek bed another time and spends about a third of a mile on a relatively flat stretch on the east side of the creek. 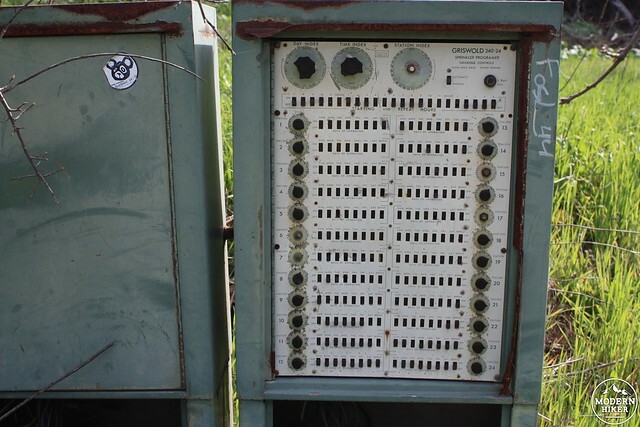 Along the way, you’ll spot a few rusted out, delightfully analog irrigation timers from the old ranch days. If you’re a fan of knobs, switches, and levers, these old Griswold boxes are sure to pique your interest. For as low-tech as they look, they certainly look very customizable – and probably easier to program than anything we’ve got today. At the 1.3 mile mark, stay straight to continue on the Valley Trail. For a little more than the next mile, the trail stays on this old ranch road as it heads north and makes a very, very gradual ascent. 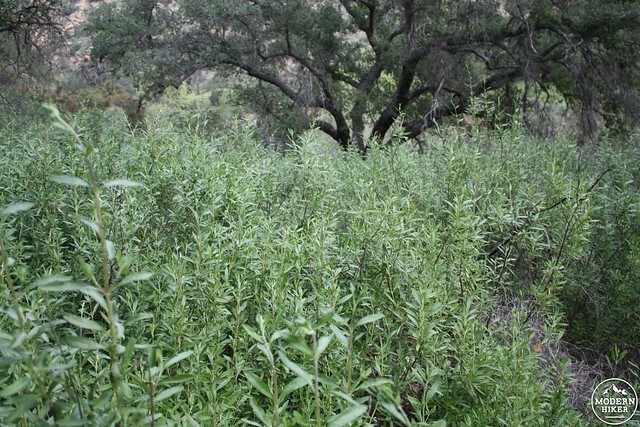 Giant oaks will occasionally tower over you and huge clumps of purple sage hug a few of the hillsides. It’s a very pleasant stretch of trail but not necessarily the most exciting. 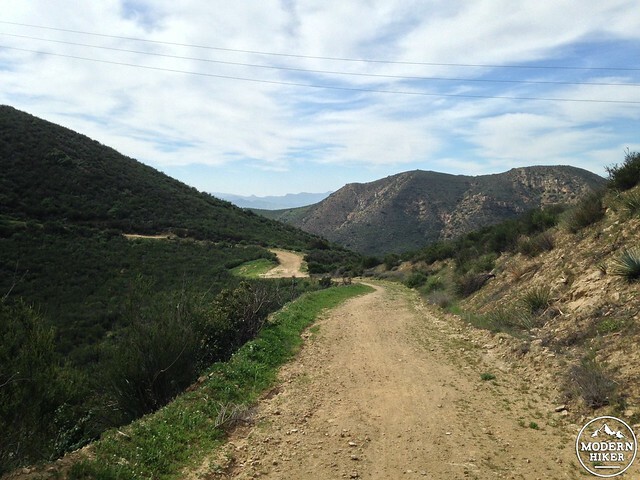 At 2.4 miles, look for a well-worn use trail leaving the fire road and heading toward the Las Virgenes Canyon Creek bed (the unsigned Sheep Corral Trail). By now, you’re probably a little tired of hiking on fire roads. Luckily for you, the trail is about to get much more interesting. First, the trail makes its way through a beautiful grassy meadow area alongside the creek bed. Shortly thereafter, it opens up into a gorgeous grove of mature oaks. 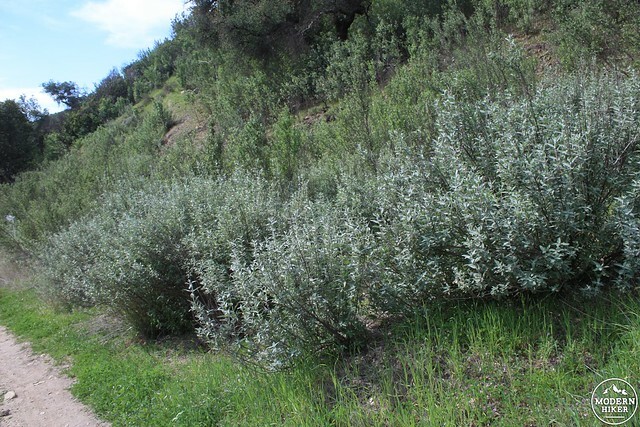 As it continues toward the northwest, you’ll also pass several huge ceanothus bushes and a rather sizable colony of person-sized black sage. 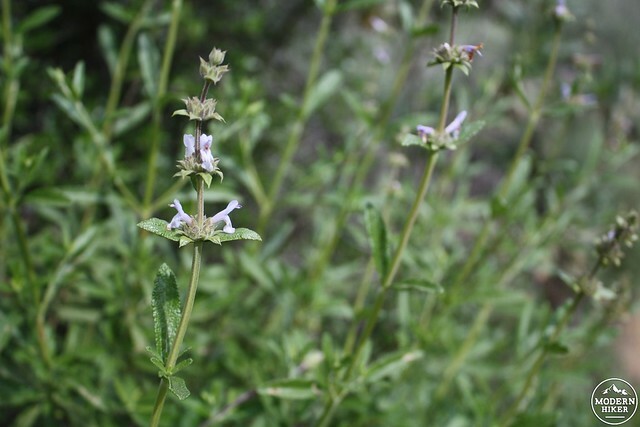 If you’re like me and the smell of black sage has a catnip-like effect on your brain, just make sure you check for ticks after you enjoy getting handsy with the plants. 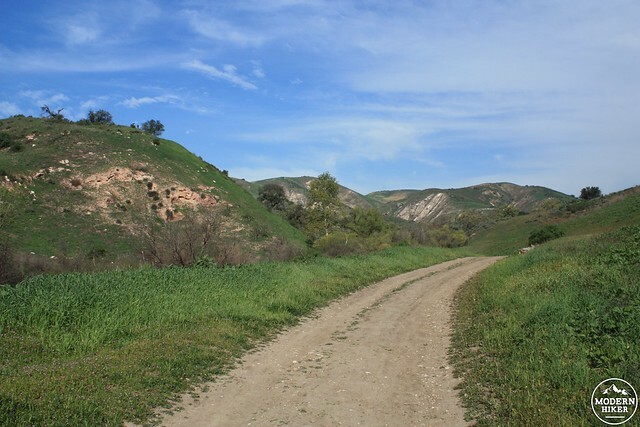 At the 2.8 mile mark, the trail makes a sharp turn to the west and begins a relatively intense climb out of Las Virgenes Canyon. Until now, you’ve only climbed a little over 250 feet in 2.8 miles – now you’re about to climb a similar elevation in less than a half of a mile. 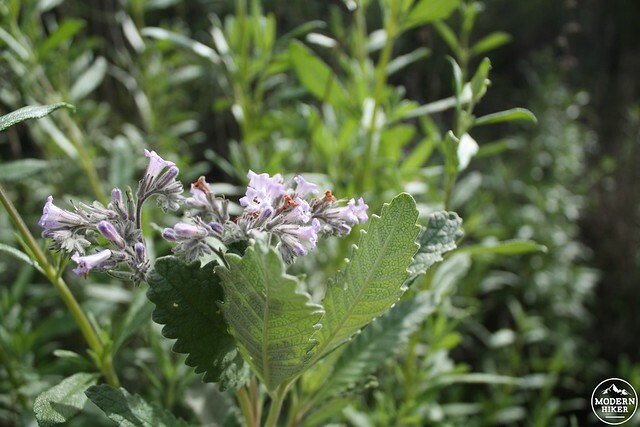 You’ll have plenty to look at – including beautiful long views of the canyon and a rugged trail lined with Yerba Santa. 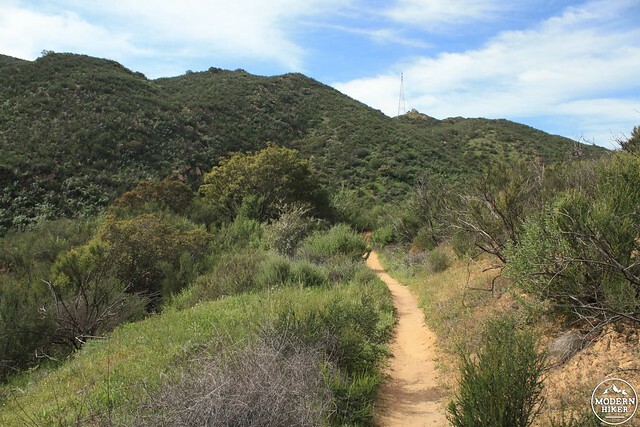 This rugged trail climbs westward, following the north face of a short side-canyon off Las Virgenes. This stretch of the hike stands in stark contrast to the earlier sections along the fire road – but because it’s so drastically different you probably won’t mind the steep climbs or rough terrain. Take note, however, that there is almost no shade from this point onward. While you may not mind the sun in the late winter or early spring, you will definitely be sweating by this point if you’re hiking during the summer. 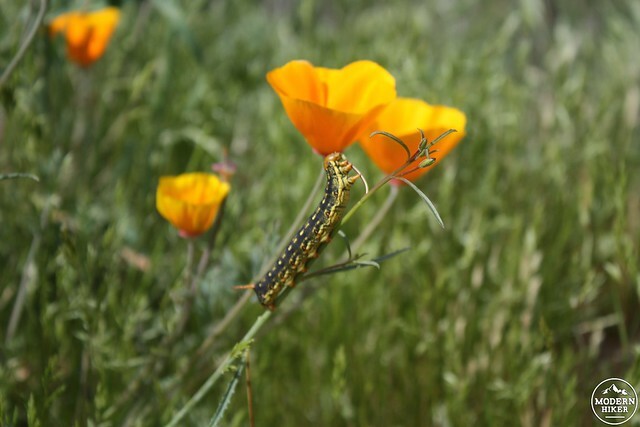 Enjoy the canyon views and rock formations – and be sure to look downward for wildflower blooms (and their accompanying wildlife, of course). 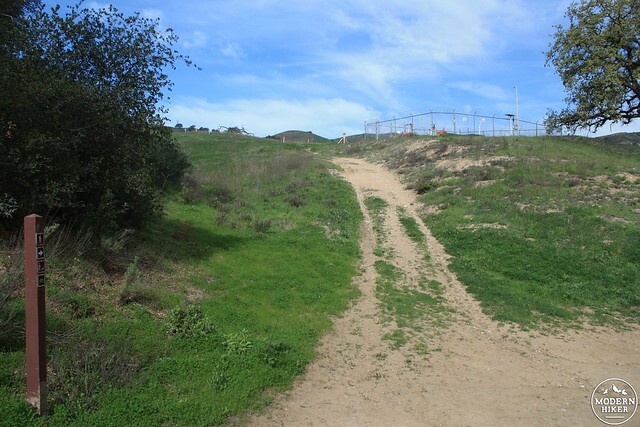 After two elevation pushes, the trail levels out a bit – and just before the 4.1 mile mark you’ll reach a signed (!) junction with the Cheeseboro Ridge Trail. 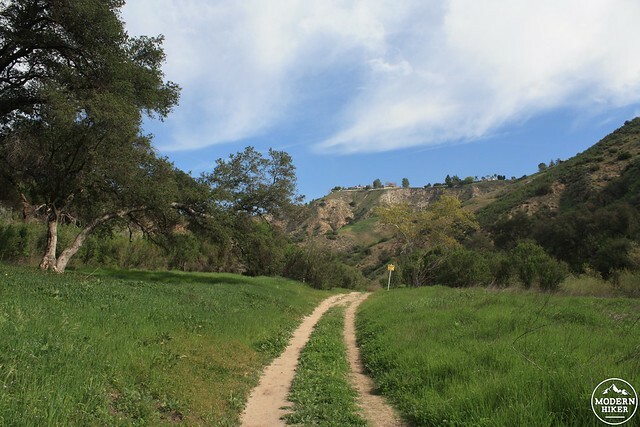 If you’re in the mood for an epic two-canyon hike, stay straight and the Sheep Corral Trail will take you to the northern end of Cheeseboro Canyon in another 0.3 miles. For this route as described, take a left at the junction to hop onto the Cheeseboro Ridge Trail. From here on out, the trail is back to wide fire road – and you’re more likely to see a few mountain bikers zipping from canyon to canyon. 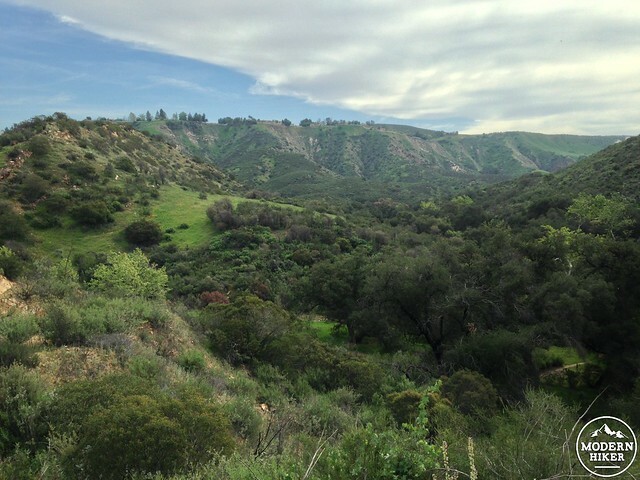 The road here travels along a ridge that’s roughly halfway between Las Virgenes and Cheeseboro Canyons, and you’ll alternately get birds-eye views of each of them – along with some truly spectacular and unusually-angled views of the Santa Monica Mountains as well. You’ll pass the high-point of the hike just past the 5.1 mile mark, and at 5.35 miles stay straight to continue on the Ridge Trail heading south. Here, the terrain becomes a little less jagged and more rolling-hills style. 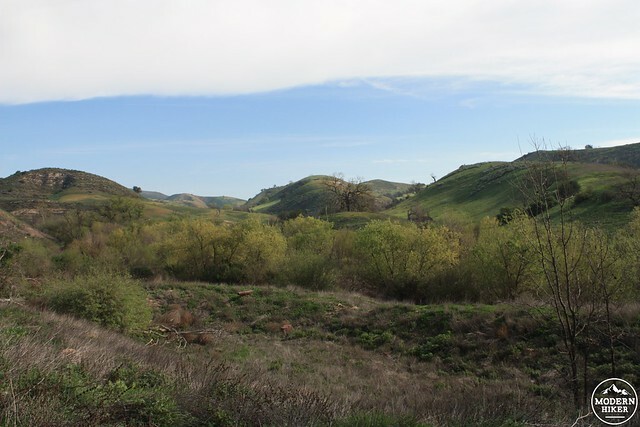 Keep an eye out for the Baleen Wall in Cheeseboro Canyon to your west – a large, white cliff formation that’s very noticeable in the otherwise green (or brown in the summer) hills. In the spring, you’re also likely to see a lot of lupines along this part of the trail. 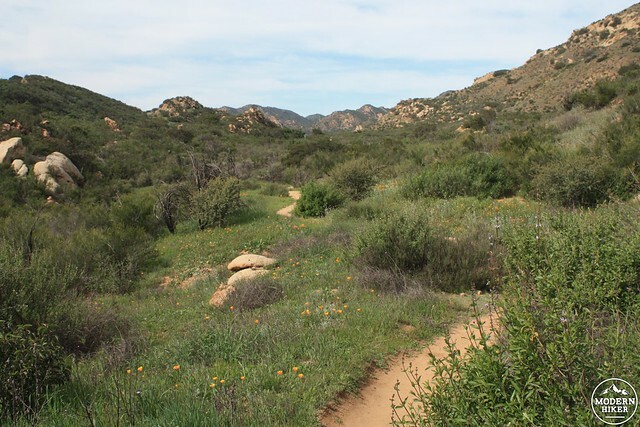 Stay on the main trail and ignore all use-trails and old ranch roads as the trail makes a gradual descent. 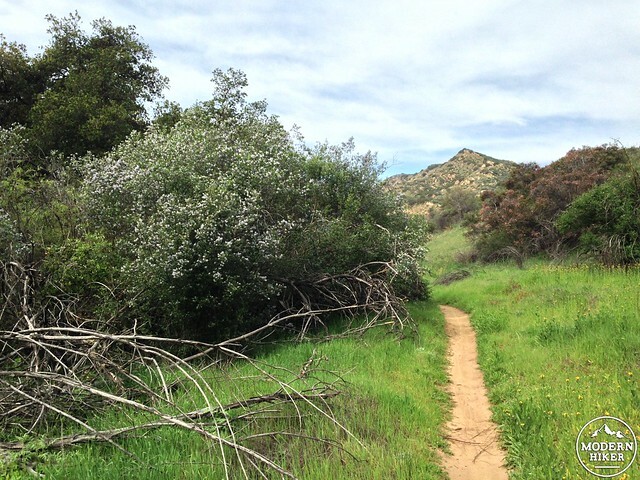 Just past the 7 mile mark, take a left at the junction to hike on the Las Virgenes Canyon Connector Trail. 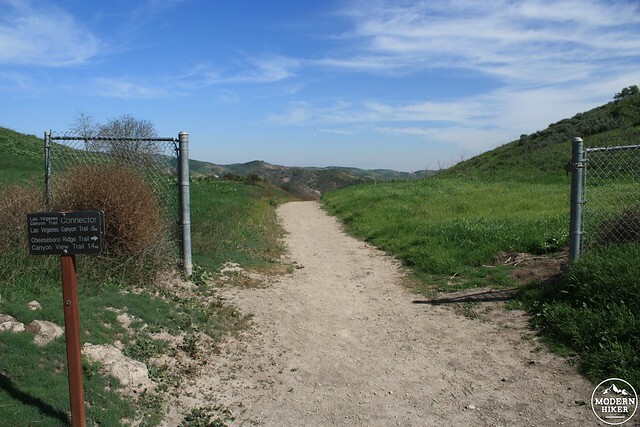 Ignore the side-trail just to the east and continue hiking through an open chain link fence to head back into Las Virgenes Canyon. Ignore the narrow use-trail at 7.4 miles and keep right at the junction at 7.7 miles to finish the loop and return back the way you came. Trails are mostly in very good condition - the main issue here is one of confusion. 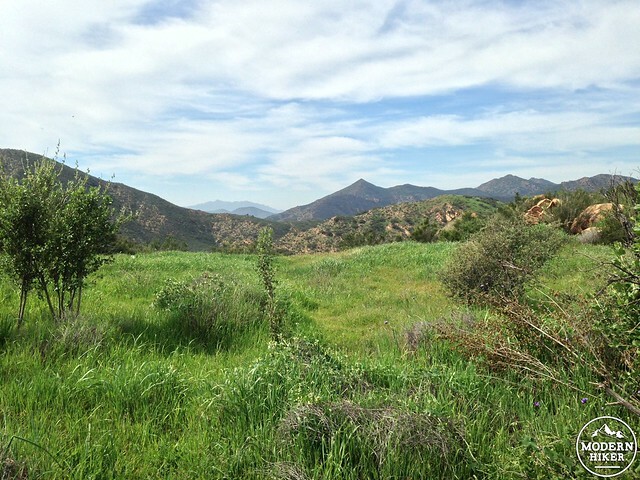 This park is on old ranch property, and many old ranch roads will compete with established trails for your attention. In addition, hikers, mountain bikers, and equestrians have created their own use-trails in parts of the park - many of which are not on maps. Some junctions are very well signed, while others are marked with confusing directions or no signs at all. 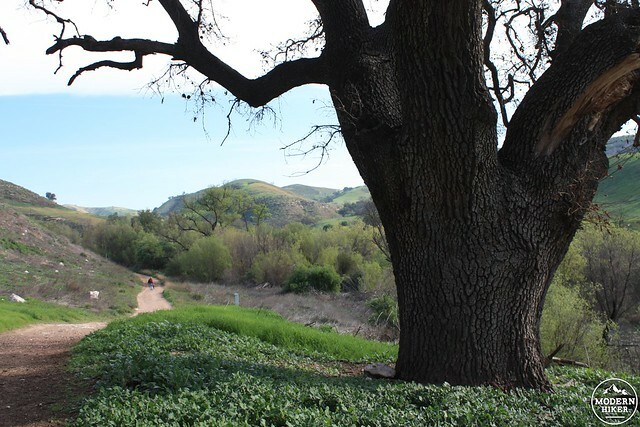 As with the rest of the Upper Las Virgenes Canyon Open Space Preserve, we strongly recommend you study this route or bring your own topographical map with you. Maps provided by the park are short enough on detail to get you lost. From the 101 between Thousand Oaks and Woodland Hills, take the exit for Las Virgenes Road and head north. Drive until the road dead-ends in 1.4 miles. There is free street parking on both sides of the road, but one side has street cleaning from 8-11AM on Mondays. Metro Bus Line 161 will drop you off at Las Virgenes Road near the 101 onramps. It's about a 1.4 mile walk to the trailhead - doable, but maybe not practical. We appreciate it, most definitely! Definitely give this another try. 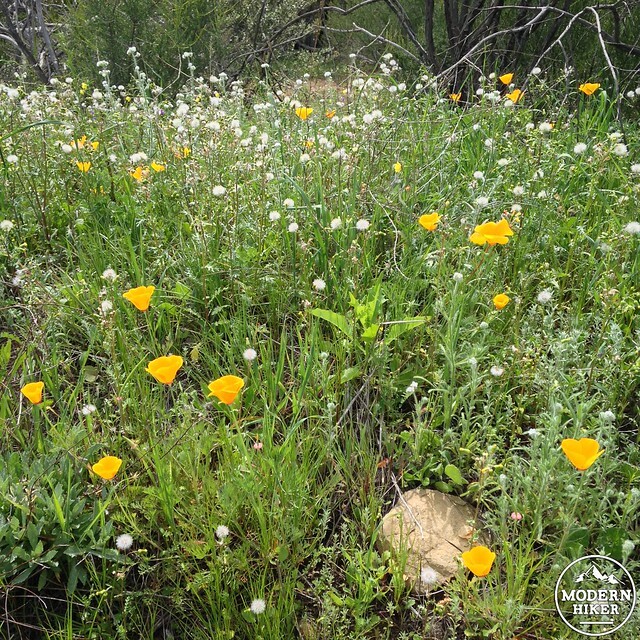 This region should get some really nice wildflower blooms in the next few weeks - or you can check out the nearby Victory Trailhead Loop for an area that might be less soaked than the lowlands of Las Virgenes Canyon! This site's directions were perfect as far as I got and I may try it again someday, but in the meantime I wanted to add my most recent review of the trail so others know - there are currently multiple, unavoidable, tough 15-foot long 2-feet deep water crossings. To be fair, we DID just have the biggest single rainstorm in like 80 years less than a week ago. So yes, trails are going to be a bit more wet than they are during normal years or especially during drought years. 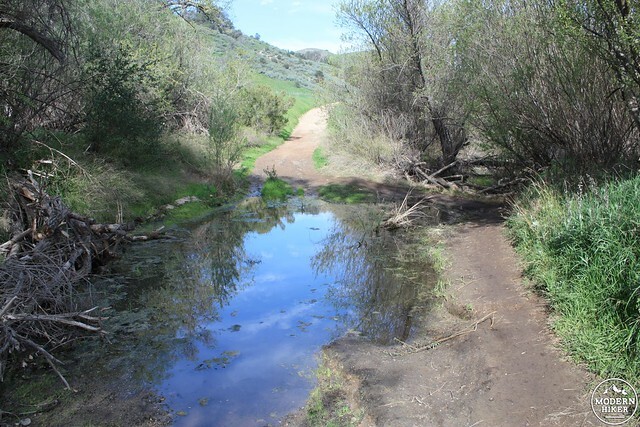 With rain like we've had, you should expect *every* trail with an arroyo or creek bed to have water in it. I've got two different pairs of boots drying out right now from hikes I did this week - getting dirty is part of the fun of hiking! Just tried this hike and it was awful. There were 3 huge water crossings before the first 1.5 miles, probably due to the heavy rains this winter, but I was not expecting this since the writeup only mentioned one, and it hasn't rained for at least the past 5 days. There are no ways to get around these water crossings either, you just have to walk through/across the water and hope to balance on some sticks or hop on a shallow raised muddy area. It is nearly impossible to not get wet. After the 3rd or 4th water crossing I bailed on this trail, went back to the 1.4 mile mark and left this trail and went back via the eastern side open space. Still, had to do 1 water crossing to get back to the car and that's when I lost my footing and ended up in the water, up past my knees. I DO NOT recommend this trail in the Winter. Just did this today and it was pretty deserted, which I like. 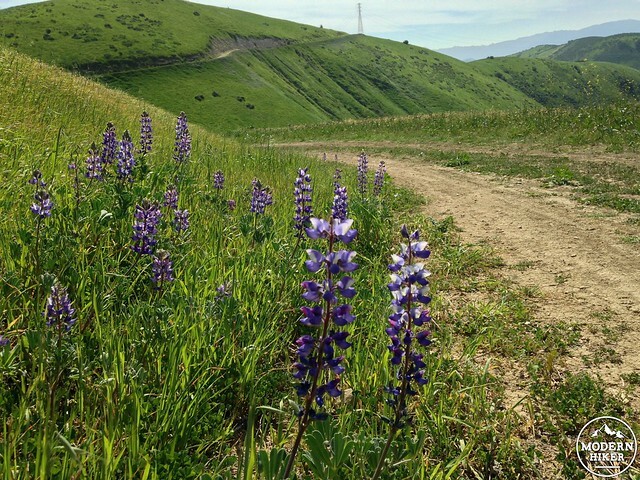 Still lots of wildflowers out, though the lupines are all dried up.It was nice to try, and the mile off the fire road was enjoyable, but the remainder on the fire road got a little tedious, especially towards the end. Would make a good trail run out and back over the hills done in reverse. Thanks for the very clear directions.